There is something fishy going on. I love sushi. I mean LOVE sushi. It’s not cheap so I don’t eat it very often so it’s a real treat for me. Imagine my surprise when I read an article earlier this year about how more than half (55%) of the fish sold in Los Angeles was mislabeled, or in other words, you think you’re paying for an expensive type of fish but you’re getting a cheaper fish instead. Besides being downright fraud, this is a dangerous game. Some people are allergic to specific species of fish, while some other species are more prone to have high levels of mercury which can be especially dangerous to pregnant women and children. Some of the fish was being substituted with Escolar, which can make people sick. Escolar is banned in Japan for this very reason but apparently it’s a-OK for us to eat. Part of me thought that this must be an isolated issue. Deep down I knew it probably wasn’t. Unfortunately the deep down part was right. I recently came across another article doing tests on the east coast. Again, half were mislabeled. White tuna, which is one of my favorites, turned out to be Escolar 100% of the time. This study was what prompted the L.A. study. In the L.A. study, Red Snapper shared the same fate as white tuna, being substituted by either pollock or tilapia. The most appalling number, though, was that 87% of 10 species of fish tested in sushi restaurants across L.A. were mislabeled. 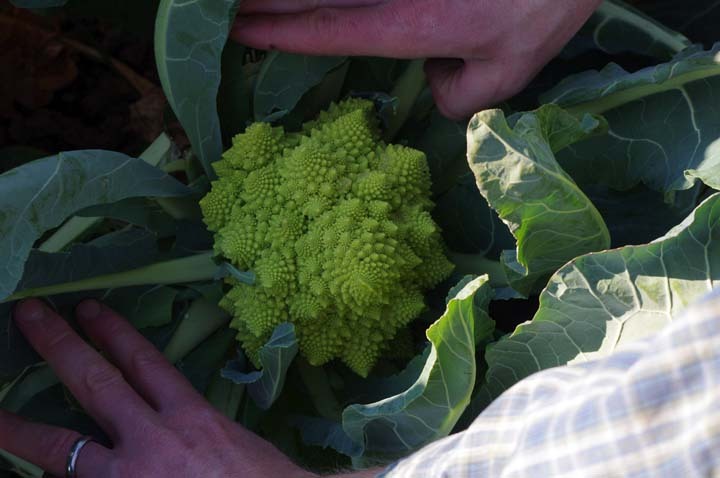 Romanesco cauliflower starting to head at Foggy River Farm. But what about other food besides fish? We shop at farmers’ markets for the majority of our produce. In California, we have protections in place to keep unscrupulous people from scamming consumers (California is looking to pass a law about correctly labeling fish currently). Certified Farmers’ Markets require that farmers have a producer’s certificate showing that they do indeed grow what they are selling. But even that isn’t foolproof as shown back in 2010 in Los Angeles. Scammers were selling produce they purchased wholesale as local and certified organic when neither was true. Their fields were empty except for weeds and yet here they were selling immaculate produce. I know in other states this is a common practice at farmers’ markets because those states don’t have any protections for the consumer. From what I’ve heard from people in other states, this is actually a huge problem. And not only is it fraud, but it also hurts the real farmers out there that are doing good work. They lose out on sales because they are being undercut by these con artists. So how do you figure all this out? Unfortunately, I really don’t have a solution on the fish issue other than being really familiar with it. I know one place in my town that for sure doesn’t correctly label their fish so I avoid that place. I just hope the one place I do like to go to is being honest. But with other food there are some steps you can take that will help you figure out who is legit and who is trying to pull the wool over your eyes. Talk to the farmer. Ask them lots of questions including what they spray, where it’s grown, how they avoid pests and most importantly, can you tour their farm. If they say you can tour, do it. Go visit their operation if you can. We try to do this on a regular basis. See what the quality of their produce looks like in the field. Does it coincide with how their produce looks at the farmers’ market? Are they growing everything you’ve seen at their stand that season? If it’s not on that site, ask where that specific produce comes from (many times farms lease land in other locations). If they are not willing to tell you, let alone show you, then don’t purchase their produce. If you can’t tour their farm do some research on them (but ask if you can tour anyways to see if they are amicable to that). Contact their county to make sure they have that producer’s certificate for everything they are selling. Google their address to make sure it exists and to see what their land looks like. It will require some work on your part, but in the end you can feel secure in the fact that you aren’t getting ripped off. Of course the other option is to grow and raise your own food if you’re lucky enough to have the space to do it. ← Merry Christmas and Happy Holidays! You really can’t trust anyone these days in the retail business…….best bet is to just grow it yourself. While that is almost impossible unless you want to be limited to only eating what is in season in your area. The one retail store I do trust is Trader Joes in California. I know they are expanding now to other states. They have a committment and food philosophy that I trust. Trader Joe’s is definitely better than most but they still don’t sell local or sustainable produce, meats, eggs or dairy. They are all over the country already. I live in NY and it is very hard to find locally grown organic food. My husband likes to buy food from these two stands because they are cheap, but they have given me a few clue’s that they are not growing it themselves at all. I grow most of our vegetables during the summer, but I actually feel better about supporting our local Wegmans (grocery store), because I know that they do buy from local organic farmers. It’s not your end. Last week (right before leaving for vacation, of course), my blog self destructed (I suspect due to an automatic WordPress update). I’m home now and trying to get everything to work again. Unfortunately I lost a year’s worth of content in the process.